Letting the Professionals in Denver pick my tunes today. "A very unusual date from Art Farmer, who is better known for his top-notch hard bop with Benny Golson. This is a more cerebral outing, moody and brilliantly performed." New release from Jerome Sabbagh. With guitarist Greg Tuohey of Romantic Funk fame. So much regard is given to audio quality in the 21st century that there has become something of an obsession with "purity." A desire for music that has no digital manipulation, no computers layering sounds together. 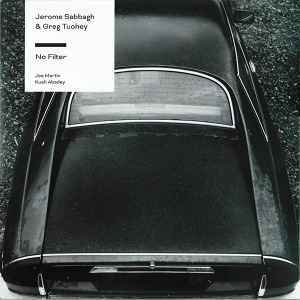 As co-band leaders, Jerome Sabbagh and Greg Tuohey resolved to attain this quality on No Filter by recording the album without edits or overdubs, directly to analog tape. Everything the listener hears was captured in one take, on paper suggesting a live album recorded in a studio. Not that No Filter sounds like one. The album actually has a smooth, polished feel, never rough or raw. Audiophiles with high-end equipment will be happy, no doubt. Speaking about their decision to record the album in this traditional manner, Tuohey says that "[recording analog] is really about just trying to remove as much 'stuff' between the emotion that we're experiencing, and the emotion that you're hopefully experiencing as a listener." No Filter, from start to finish, has a "less is more" philosophy backing it. Sabbagh's saxophone is understated throughout, and Tuohey seems content to play guitar to whatever effect the song requires, be it a sorrowful cry or menacing howl. This just came in the mail a couple days ago, but is as yet unopened. Is it a “first spin in the car” CD or should I sit and listen upstairs? Upstairs would be my suggestion. Brand new release on Mack Avenue. While it would be hard to pick one Miles album as his masterpiece, if forced to do so, this is what I'd pick. Heard this in one of my favorite rooms at Axpona. I mentioned to the host that it reminded me of Gil Evans from that same time period. Looking at it in Roon today I notice that the title song is also on Out Of The Cool by the Gil Evans Orchestra. Continuing with another recording that features Ray Crawford on Guitar, as did Out of the Cool. More Ray Crawford guitar work.